FBI says San Bernardino shooters didn't post Facebook jihad messages. 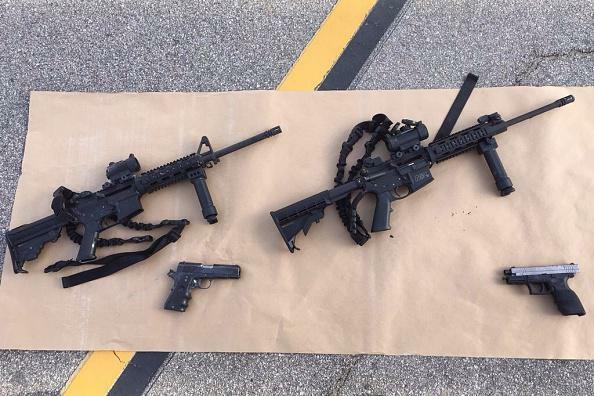 Weapons at the scene of the shootout between police and the perpetrators of the San Bernardino, California, massacre on Dec. 4, 2015. On Dec. 12, the New York Times reported that San Bernardino, California, shooter Tasfheen Malik talked “openly on social media about her views on violent jihad” before being approved for visa entry into the United States. That would be a very big screw-up by the U.S., right? “Had the authorities found the posts years ago, they might have kept her out of the country,” the paper wrote. The husband-and-wife duo were “showing signs in their communication of their joint commitment to jihad and to martyrdom” through private messages, rather than publicly visible postings, [FBI Director James] Comey said. A garble! Is the New York Times garblin’ on us?